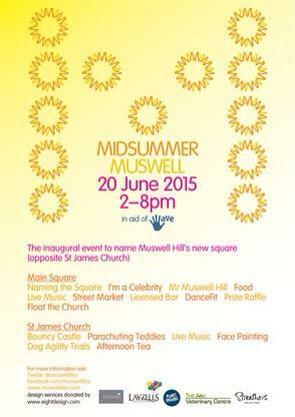 So, excited about the Midsummer Muswell Festival taking place this Saturday, I have been organising the stalls and the volunteers as well as doing the rounds with posters and flyers!!! It’s been such an experience getting stuck in and meeting local people, I can say I have met some truly inspirational people who are on the organising committee with me. Their ability to make things happen with a positive attitude is testament to what you can achieve if you really try! Hope to see you on Saturday along with the sun!